With an experience of over two decades in handling the various process applications in Dyes, Intermediates, Pigments, Pesticides, Fine Chemicals, Rubber Chemicals, Bulk Drugs, API and Nutraceuticals. 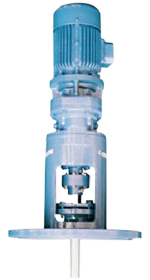 We offer well-engineered and optimum agitation solutions, mixing agitators, industrial agitators, chemical agitator, industrial agitator, chemical agitators, for all your Mixing Tasks. Contact parts are SS 304 / 316 /Mild Steel/ Rubber Lining.